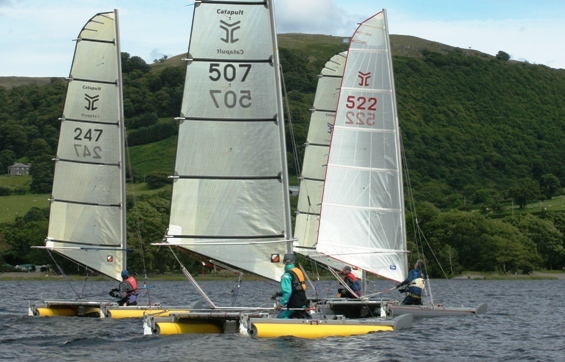 The satisfaction of pushing the boat on a reach in fresh breeze is demonstrated by John Terry (photo right, at Bassenthwaite) whipping along under easy control. frequent check, sheeting in when the windward telltale stalls, and out when the leeward one stalls.--- in stronger winds it is more important to keep the windward ones flat than to get the leeward set streaming flat as well, as long as not carried to extremes. Below: Lake sailing gives shifts and lulls--in lighter breeze, watching the telltales and quick sail adjustments grab the chances. In light to moderate breezes, a gust will produce a big speed difference--and then a big shift in the apparent wind, so quick and continuing adjustment is needed to take full advantage. 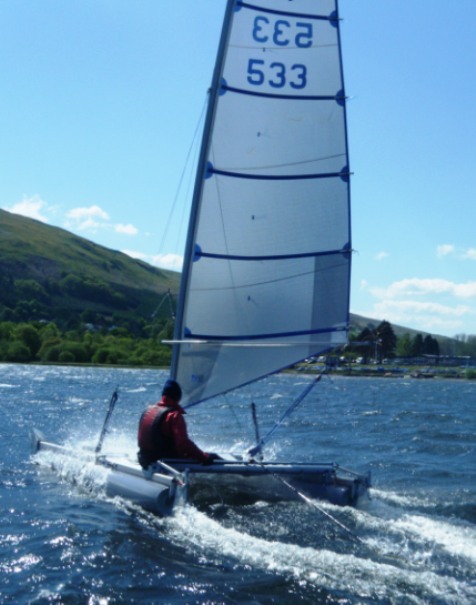 At Bala, Gareth ahead in 521 is responding to a puff and is away, sheeting in and leaning back-----you can feel Alex behind telling the breeze to arrive, so he can follow, but Gareth will be 20 yards on before Alex sets off, and 40yds if Alex is slow to readjust. Gareth, left, never cleats the mainsheet, to be able to adjust as quickly as possible, so on the reach he is making constant adjustments to keep the telltales streaming. The boats behind the bunch (right) will be delighted that they have bunched up like this---some of them at least must be getting poor breeze, they will be distracted from adjusting for best boat speed, and it is likely that they will push each other up to windward of the proper course to the next mark, having to bear away and go slower as they get near it. In moderate winds, puffs will swing the apparent wind forward quickly, with the shift increased as speed picks up. In the photo below, the Comet rig in the middle (coloured sail) and 518 behind have responded to a puff, sheeting in, while 507 still needs the main well out. 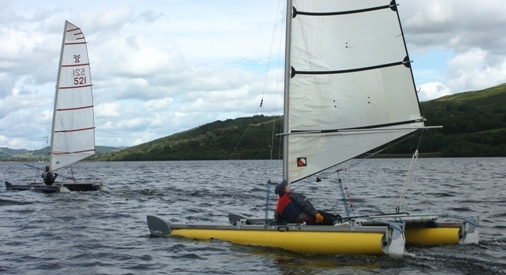 The photo shows that in a tight reach, weight will stay largely in the middle (until the wind is stronger, next section) while the helms in the photo above, on a broader reach will need to be ready to shift back from their position forward. Below: Gybing onto a broad reach in a lovely fresh Rutland breeze. Alastair (leading this bunch) comments "I have to keep telling myself that the priority as soon as rounding onto the reach is to get immediate boat speed---I get distracted by other boats or by adjusting the outhaul --the boat has to be got going quickly, and then other things can be looked at. Otherwise you will find one of the boats behind up on your shoulder going past"